What Is Vassoul Retinol Moisturizer Cream? As per the manufacturer, Vassoul Retinol Moisturizer Cream is a natural skincare cream, produced to assist in wrinkles, fine lines, and acne scars reduction. It’s manufactured from the use of natural ingredients, which function well in boosting skin moisture and collagen levels, thus boosting skin tightness and elasticity. 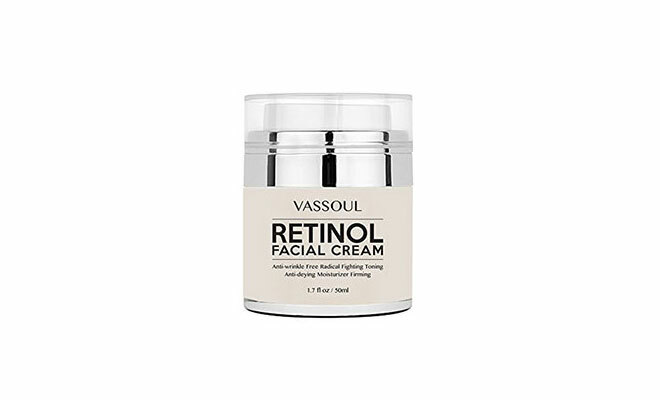 Vassoul Retinol Moisturizer Cream nourishes the skin well, giving the user a healthy and attractive look. It also leaves the user with a radiant and young appearance. However there are very few customer reviews online for backing its claims. This formula is available online, and the users can purchase it directly from the company’s official website. Vassoul Retinol Moisturizer Cream – Does It Really Work? Vassoul is the company behind the manufacture of this formula. It’s a brand specialized in the manufacture of a variety of skincare products, which function well in boosting the skin complexion, health, and immune function. The manufacturer states that, this is a natural skincare cream, manufactured from the use of organic elements, which are potent in getting rid of acne scars, wrinkles, and fine lines. They increase skin firmness, thus protecting the skin from sagging and wrinkle formation. What Are The Ingredients In Vassoul Retinol Moisturizer Cream? This formula is manufactured from the use of natural ingredients, which function by increasing skin moisture and collagen level. This helps in the production of healthy and firm skin cells, thus aiding in the reduction of aging signs. Aloe Vera- this is a potent skincare compound, which functions well in protecting the skin from sunburn, helps in reduction of skin imperfections and contains antioxidants that protect the skin from free radicals. Sunflower Oil- it’s a compound that is rich in antioxidants and its potent in treating skin acne, eczema, and inflammations. It also reduces redness and skin irritations, thus keeping the skin looking attractive. Retinol- it’s a vitamin A derivative that plays a role in unclogging skin pores, boosting collagen production and enhancing skin cells turnover. Hyaluronic Acid- it plays a role in enhancing collagen production and skin hydration, thus boosting skin tightness and elasticity to eliminate the fine lines and wrinkles. Namely, some people complain that their skin dries out after using hyaluronic acid. Vitamin E- it’s an antioxidant that helps to quench free radicals, and it helps to prevent the oxidative damage. Jojoba Oil- it has antibacterial properties which help to protect the skin from microbial damage. It’s an anti-inflammatory agent, and it’s potent in increasing skin moisture and in treating acne. It can cause some side effects such as rash and allergic reactions. Apply this creme on a clean and dry neck and facial skin. Massage gently until it’s all absorbed by the skin. Apply twice a day to obtain fast and desirable results. It functions well in moisturizing the skin and in boosting collagen level, thus enhancing the reduction of acne spots, wrinkles, and fine lines. This product is suitable for all skin types. However customer reviews tells a different story. Its free of parabens, artificial colors, harmful fragrance, thus it functions without damaging the skin. It has few customers’ reviews and inadequate clinical tests evidence. The functions of ingredients used are not well explained, and their ratios are not given. It lacks information about free trial offers. Some customer reviews claim that it is not that effective as it claims to be. Does Vassoul Retinol Moisturizer Cream Have Any Side Effects? 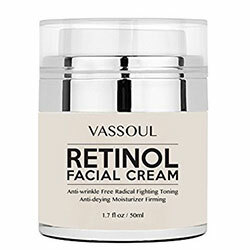 Vassoul Retinol Moisturizer Cream is a skincare product, produced to aid in the reduction of skin scars and aging spots. It’s manufactured from the use of natural ingredients, which function well in increasing skin moisture level and collagen level, thus aiding in the manufacture of healthy skin and tight skin cells. Facial moisturizing products are in no short supply today, and this large selection might make the process of choosing the best moisturizer for your personal needs to seem a bit overwhelming. Fortunately, we’ve taken the time to research each of the top facial moisturizers on how they rate in several different key categories. More specifically, we believe that every quality moisturizer should provide the basic benefit of improving overall facial skin appearance, including both skin tone and skin texture. Additionally, a quality moisturizer should contain compounds that are capable of binding to collagen fibres in order to provide the most long term results. Finally, facial moisturizers should ideally be able to deeply cleanse skin at the same time that they moisturize it. Below is a summary of our findings regarding the top facial moisturizers and these key considerations.